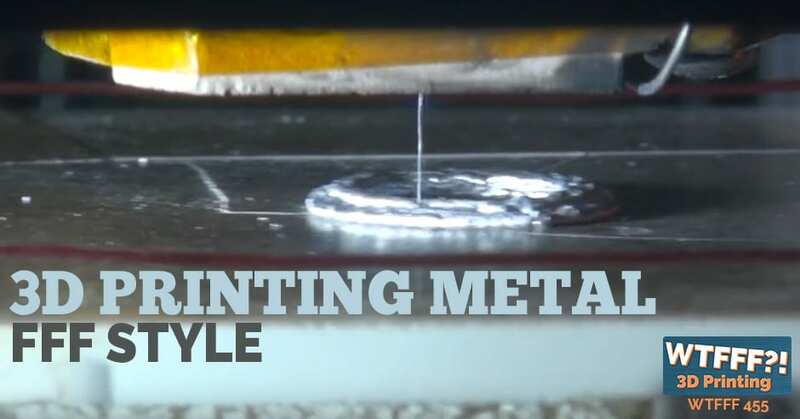 In today’s episode, Tom talks about 3D Printing Metal, FFF Style. Vader Systems, a father and son founded company out of Buffalo, New York, has invented what they call Magneto Jet. They’re manipulating liquid metal through magnetism. This is a new technology that melts a metal wire so you can do what you want to do with it in a very precise way. Vader Systems, a father and son founded company, has invented what they call Magneto Jet. Today I’ve got something really exciting I want to talk about. I read recently about this new company called Vader Systems. They are out of Buffalo, New York and they are founded by a father-and-son team. It’s a young man named Zach Vader who, at the age of eighteen, was driven by necessity in a project he wanted to do for school. He really could not achieve what he wanted to with any kind of technology that existed. As he did this project, he really came up with a concept for creating an amazing new technology that allows 3D printing of metal, in very much an FFF style or a deposition method. It’s not the same as conventional FFF 3D printing where you’re just heating materials and pushing it through a chamber. This is a different process that they’ve invented called a Magneto Jet. They have patent pending technology, which is based on something called Magneto Hydro Dynamics. Really, they’re manipulating liquid metal through magnetism. The way this works, think of an FFF style bed and a gantry where you are going to move a nozzle on the X and Y axis. Eventually, you are going to lower the bed or you are going to raise the nozzle on the Z and you are feeding a metal wire into it that then gets heated up to 1200 degrees Celsius. Quite a bit hotter than any plastic has done in FFF today. Once that aluminum or metal, because there are other metals that they can do as well, are influenced by magnetism in its molten state, they electromagnetically pulse droplets off the aluminum out the nozzle and eject it. It’s apparently incredibly precise. It delivers thousands of droplets per second and it has micron level accuracy, which a micron is a thousandth of a millimeter. I was so excited to read about this because we often read about development of 3D printing technologies. It’s either usually in one of a number of existing technologies that was born decades ago and had patents and maybe the patents expired. Now more companies are using it and are improving on it, which is great. For instance you got the RepRap Movement and you’ve got so many companies making 3D printers using FFF technology. They all have different technical aspects of it that they’ve improved upon to make printing better, more reliable, new capabilities. Same thing really with the resin printers in the SLA realm of things where you have the Formlabs printers. Other companies like XYZ have made their own resin printers and then improvements have been made by people like Carbon and other printers as well. But they are all improving on a known or existing technology. There’s nothing wrong with that. A lot of them are doing some fantastic work and it’s allowing a lot of us to use and experience it, which is a wonderful thing. Here comes a father-son duo out of Buffalo, New York. Father is a professor I think at the State University of New York and the son has engineering affinity as well. They’ve together teamed up and then went and invented this new technology to come up with a new way to melt a metal wire and then eject it, deposit it, whatever you want to call it, in a very precise way that’s very much an FFF style. When you think about powder bed fusion technology, which is really the predecessor for metal 3D printing and a very good technology. Look, I am not knocking it, but it’s very much a commercial technology. The way those printers work, they are very commercial technology large printers. They have a big chamber of finely ground metal powder, either aluminum, stainless steel, or titanium. There are lots of metals that they are using. Let’s say most of them have a bed the size of an ice chest or a cooler you might take to the beach. Filled with this pattern then lasers go in and intersect to melt the metal and fuse the powder to each other in very precise ways and create a part. I’ve seen some incredible parts made with this. Most recently at CES, the folks at Sculpteo were showing some parts because they had recently expanded their service bureau offerings with a powder bed fusion metal 3D printer and they were showing some stainless steel parts. It’s very well done. I am very excited about that. Actually I have a project that I am using where I am going to go and make some prototype parts using their service. There are limitations to it. The powder bed fusion, because there’s powder in there, the powder supports itself, which is great as you are curing it. Parts won’t fall or move around. But you have to always use geometry that is going to leave openings so that powder doesn’t get trapped inside the walls of your part. In theory, let’s just say you wanted to make a sphere for some reason, a thin walled sphere of stainless steel. Using powder bed fusion technology, if you seal that sphere all the way around, the powder in the middle is trapped in there and you’ve got a much heavier sphere and you’ve got no way to get rid of that excess powder that you really don’t need for your part to exist. You’ve got to leave holes and openings. You’ve got to design your geometry you’re going to print in ways to make sure you can shake out, blow out and otherwise, allow the excess powder to exit the part. With this new technology, the Magneto Jet technology, it’s really the same principle as FFF 3D printing. They’ve got a gantry you’re moving in X Y, you’re going up in Z and you are depositing the molten metal very similarly to how plastic comes out of a nozzle in a conventional 3D printer. You can make truly hollow parts and not have to worry about the excess powder. You can use less material. I imagine you can do infill things as well. They have to be developing that in order to make structures. A similar, I am sure, slicing scenario to what we experience with PLA or ABS. This is super exciting because they’ve developed their first printer, what they call an MK1. They are expecting that to be available in early 2018. That is what they call an experimental printer. They are developing an MK2 with the intention for that to be out in late 2018. They would have the capability of ten printing heads, be much faster than the MK1, and they are looking at other metals like conductive metals. I think I was reading somewhere that they are going to be able to do copper and other kinds of metal besides just the aluminum, which I think is fantastic. I am super excited about this. Look, it isn’t there yet. We decided it’s premature to try to interview these guys about it because I am sure so much is changing. We can’t review a printer because they are very new and they are not commercially available yet. I just want to talk about it today as a super exciting event in the world of additive manufacturing that’s really pushing the edge of the envelope of technology and what can be done. I think the entire industry is going to benefit from it, and certainly as users, I am super excited. I am hoping that they make more of a desktop version of this printer that will be financially within the reach of makers and schools and even people in business like me that make prototype parts a lot with 3D printing. I’d love to make metal 3D printed parts. Anyway, I am really excited about this company because it really is built out of necessity, with this father-and-son team, started with Zach who at the age of eighteen is going down a path trying to do a project for school and he couldn’t achieve what he wanted to. Instead of just accepting that and figuring, “I’ll use what tools were available to me,” he started down this path of exploration, invention and came up with a completely new technology that enabled him to achieve his vision. That is such a wonderful story and invention process. It’s exciting for me to read it as a designer and an inventor. Now, this is high tech invention. My inventions have never been really this high tech. These guys have just followed their dreams and their own path. They’ve gotten help. I was reading somewhere from the University of Buffalo, State University of New York have given them a place to work and help with some funding or I think helped with some funding. I don’t have a real source for that. I read that from a different article that I am not looking at right now. It appears to be the case. I just really hope that they do continue and that they realize their plans of production of their first printer coming out in 2018 and then this next generation after that. I can’t wait to see it and hope eventually that we can get to review and certainly try that printer. If it’s not out of reach, I am going to want to buy one. I would imagine a lot of people who do jewelry, that this may be a new opportunity as well for that industry. Really anything involving metal parts that would use one of the different metals they have available. Boy, isn’t that going to be really practical to have a spool of wire, just like you have a spool of filament that you would feed into the machine. If you know either of these guys, then we’d love to hear about it. Come and comment at the bottom of the blog post, 3DStartPoint.com. Even if not, if you have some thoughts or ideas you want to share about the potential of this technology, let us know. You can also reach us anywhere in social media @3DStartPoint. Thanks for listening everybody. I will be back with another episode tomorrow. This has been Tom on the WTFFF 3D Printing podcast. How do you get hold of that hot-end? How detailed can you make a print (surface definition) and how micro-porous will the final product be? which metals besides aluminum, bras lead, tin, indium, bronze and pewter can you hope to do? I think you have something here even if you have to polish up the surface! !